April is Parkinson’s disease Awareness Month. Support your loved one battling Parkinson’s and honor those taken from us with our unique and inspiring Cure Parkinson’s Disease Awareness T-Shirt. Our Parkinson’s Awareness T-Shirt is great for giving hope and spreading awareness so that people suffering with Parkinson’s disease may lead effective and fulfilled lives. Our Parkinson's Awareness T-Shirt is available on our premium 100% cotton T-Shirts, machine washable in youth sizes XS-L and adult sizes S-3XL. Additional Info MyWalkGear.com is dedicated to promoting Awareness for Parkinson’s disease, supporting those battling Parkinson’s, honoring those taken and encouraging others to get involved in the fight for a cure with unique Parkinson’s Awareness Walk Shirts and Walk Gear. 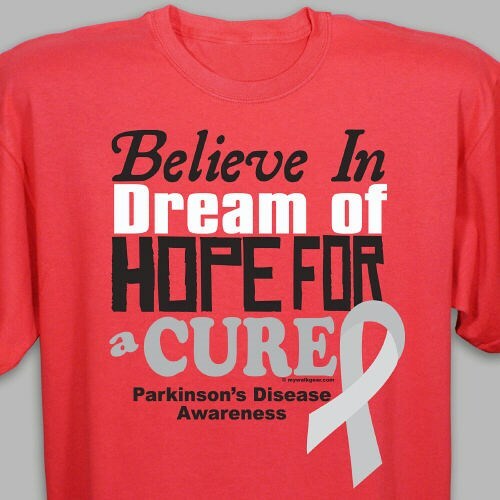 Help us help those who need us the most with this inspiring Awareness t-Shirt or our Cure Parkinson’s Disease Awareness Key Chain and Cure Parkinson’s Disease Long Sleeve Shirt. You will feel great knowing every purchase made MyWalkGear.com will donate a portion of the proceeds to end this disease once and for all.